Jon Grant, a bespectacled democratic socialist and a long-time tenants’-rights organizer, is going where few City Council candidates ever go. As Seattle’s August 1 primary election approaches, he is visiting tent cities and homeless encampments. He is traveling to enormous public-housing complexes and small subsidized units across the city. He is knocking on doors that never get knocked on, and talking to residents who rarely, if ever, draw a politician’s attention. And he is being rewarded for it. What if People Owned the Banks, Instead of Wall Street? Since he kicked off his bid to fill an open City Council seat late last year, Grant has raised more than $200,000 in campaign contributions, much of it from Seattle’s homeless population, its affordable-housing denizens, its immigrant communities, and its working-class residents, among other constituencies that are too often ignored by mainstream politicians. Grant’s has been a lucrative, if unconventional, electoral effort. And it has been entirely enabled by a newfangled political instrument called the democracy voucher. Like other progressive candidates in this year’s City Council elections, Grant is benefiting from an ambitious experiment in campaign-finance reform currently underway in the city of Seattle. 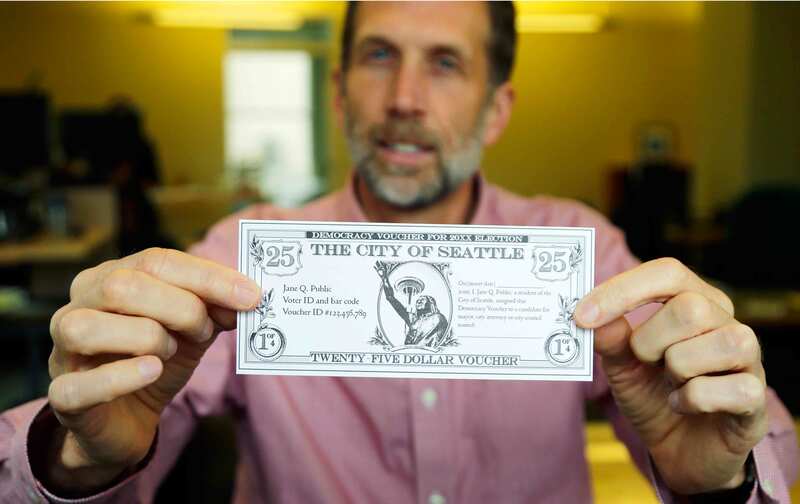 Created by a ballot initiative in 2015, the one-of-a-kind program, which is being implemented for the first time right now, works like this: At the beginning of each election year, every eligible resident in Seattle receives four $25 democracy vouchers in the mail. They can donate these vouchers to any combination of candidates they choose. Legal voters, as well as green-card holders, can all participate in the program, which is funded by an increase in local property taxes that will bring in $30 million over 10 years. And though the program presently applies only to City Council and city attorney races, it will expand in 2021 to cover mayoral elections too. This populist and deeply egalitarian reform is already upending the old political-money game. This year, Grant, the former executive director of the Tenants Union of Washington State, is leading his field in fundraising, having received more than 90 percent of his campaign donations via democracy vouchers. Councilmember Kshama Sawant and leading leftist groups in the city such as the local Democratic Socialists of America chapter and Socialist Alternative have all endorsed his campaign. Among his key platform planks: a proposal to enshrine collective-bargaining rights for tenants in the city as well as one to levy higher taxes on large corporations like Amazon in order to “massively expand affordable housing” in the city. Teresa Mosqueda has also benefited from a democracy-voucher haul. A longtime labor organizer and the political director of the Washington State Labor Council, she is one of the multiple progressive candidates vying with Grant for City Council Position 8, an at-large seat that represents the entire city. Mosqueda says her campaign, which is focused on economic, labor, and housing rights, has raised more than $100,000 through the new program. Encouraging grassroots and community-based candidates to get on the ballot, enabling people without large sums of personal or corporate money to be competitive, leveling Seattle’s electoral landscape—that is what the democracy-voucher program is meant to do. After an earlier and more traditional campaign-finance-reform initiative failed at the Seattle ballot box in 2013, Muñoz-Howard and a broad coalition of political allies, including the Latino advocacy organization Progreso and a statewide grassroots group called Washington CAN, decided to try again. In 2015, they ran a new ballot initiative campaign called Honest Elections Seattle. Among other provisions, the ballot measure barred city officials from lobbying their former colleagues for three years after departing office, limited individual campaign contributions to $500, and improved campaign-finance transparency in the city. Its centerpiece, though, was the democracy-voucher program. And, indeed, democracy vouchers excited Seattleites. After a prolonged grassroots campaign that saw reform proponents specifically focus on turning out immigrant communities and communities of color in south Seattle, the initiative won with more than 60 percent of the vote. The victory, says Muñoz-Howard, “turned the table on the traditional power map of Seattle.” And, so far, it seems to be working. Since January, at least 4,974 individual voters have donated their democracy vouchers to one or more candidates. What’s more, the program has enabled a more grassroots form of vote-getting to flourish in this year’s election. Consider Jon Grant. Rather than run a consultant-driven campaign that relies on ad buys and targeted outreach to “high-propensity” (read: wealthy white) voters, his campaign is going door-to-door in immigrant enclaves, in black and brown communities, and in affordable-housing complexes that are often left out of the electoral process. The popular and empowering nature of the democracy-voucher program—and its clear benefit for radical candidates like Grant—is not going unchallenged, however. A right-wing legal backlash is brewing against it. 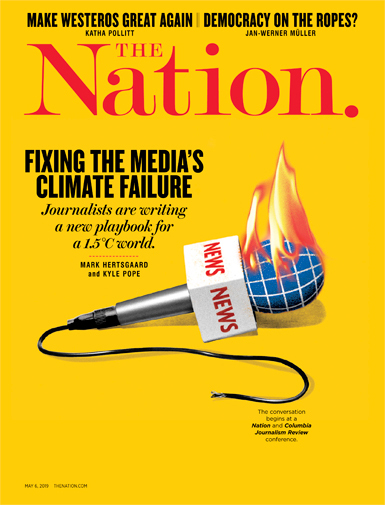 On June 28 this year, the Pacific Legal Foundation, or PLF, a conservative law firm, sued the city in state court in an attempt to roll back the democracy-voucher program, arguing that it uses public money to sponsor politicians that taxpayers may not personally support and thereby infringes on their First Amendment rights. In a statement published by Seattle’s weekly newspaper The Stranger, a PLF attorney named Ethan Blevins used Jon Grant’s pro-tenant campaign as the prime example. “So rental-property owners are forced to bankroll a politician who is adverse to their rights and interests,” he said. The PLF, it should be noted, has received millions of dollars in support from dark-money funds and foundations tied to reactionary billionaire heirs like Charles and David Koch and Richard Mellon Scaife. Between 2010 and 2015 alone, for instance, it received at least $222,000 from Donors Capital Fund, a dark-money entity based in Alexandria, Virginia, and linked closely to the Koch network. Its lawsuit is presently ongoing. If the democracy-voucher program survives this legal challenge, if it continues to be allowed to take root in Seattle, organizers there believe it could well become a model for other cities around the country that seek to drive big money out of politics and give everyday people more power to shape elections.